Over Thanksgiving weekend, I rewatched The Lord of the Rings. It was partly because The Hobbit is almost upon us, and partly because I was in mourning having finished Persona 4 Golden and needed something to take my mind off missing Inaba. After taking to Twitter (as you do), I learned that I wasn't the only one. In fact, a good number of people have recently rewatched Peter Jackson's epic trilogy over the last week or two. So, I thought I'd dedicate an off-topic post to sharing some thoughts about the trilogy these years later, and open it up to discussion. I watched the extended versions, and I gotta say, I think that Fellowship has the best extended cut. The other two films suffer in comparison. The scene where Boromir says the now-iconic "One does not simply walk into Mordor" had me laughing much more than I thought it would. Oh, Boromir. You gave rise to so many Kotaku headlines that day. Even this many years later, the fight against the Balrog is super impressive. I wonder if it'll ever look dated. A couple other effects are showing their age, however, including some of the green-screening, and a few times when CGI Legolas pulls stunts. Speaking of stunts, the moves that wowed me when I first saw the movie—the reverse horse-mount, the shield-skateboarding—left me colder this time. They felt more like fan-service than anything. I think I've seen 'em too many times. LOVED Brad Dourif this time around in his role as Wormtongue. Since first seeing the film, I've developed a newfound appreciation for him through Deadwood (and he was also in Dishonored!) and it's so fun to see him be so pathetic and vile here. Something that's always bugged me: In Two Towers, Gandalf is like "Look to my coming at first light on the fifth day." But Aragorn isn't like "Wait, fifth from when? Is today the first day?" That'd be the first thing I'd ask. Communication is very important in times like this! 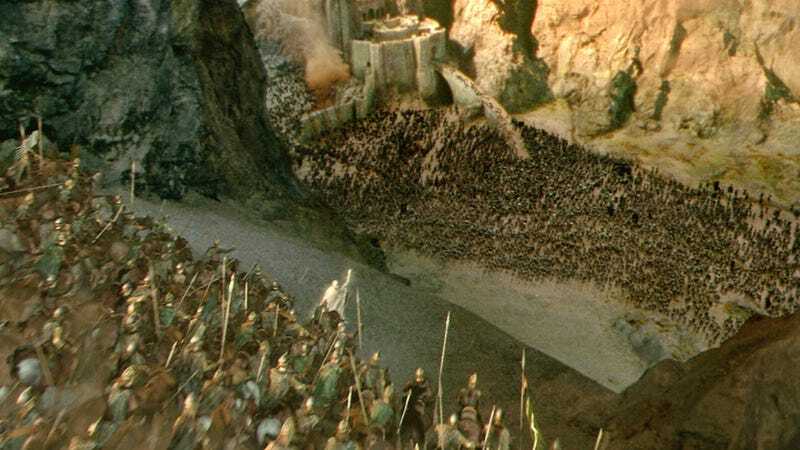 The charge down the hill at the end of the battle of Helm's Deep remains as jaw-dropping today as it ever was. One of the most truly epic moments in film history. All in all a wonderful series of films, and if nothing else, you gotta admire the balls on Peter Jackson for the scale of some of the sequences. I can't imagine that The Hobbit will match it or really, even come close, but it will be fun to travel back to Middle-Earth one more time. Anyone else out there recently rewatch LotR? What did you think? Do the movies hold up for you? Do you wish they'd left out some of the scenes added to the extended cut? Do you agree that during the final part in Mount Doom, Frodo totally looks like Ellen Ripley from Aliens? Chat about lords, rings, or anything else, here or over in the Talk Amongst Yourselves forum. Have good chatting, see you tomorrow.